Refusing to follow his party's line, eminent lawyer and Bharatiya Janata Party (BJP) member Ram Jethmalani on Tuesday said he can fight the case for convicted rights activist Binayak Sen against the party's government in Chhattisgarh. Sen, 59, was on Dec 24 held guilty of sedition by a Chhattisgarh court and sentenced to life term. He is vice president of the People's Union for Civil Liberties. "I would do it for him, I would fight for Binayak Sen. No party line says a lawyer should not fight a case," Jethmalani told CNN-IBN. He stressed that the case was based on weak evidence. "I have not seen the judgment, but on the basis of the case that was filed I can say it was a case of low evidence," he added. 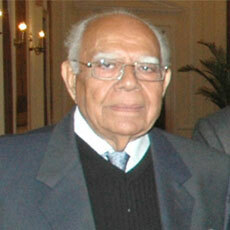 Jethmalani, a Rajya Sabha MP from BJP, earlier appeared for Sen in the Supreme Court when he was seeking bail. He argued against the state government following which Sen was granted bail. The BJP, which is the ruling party in Chhattisgarh where Sen has been convicted by a court, has been maintaining a hard stance against the Maoists. It believes Sen is a Maoist sympathiser. Father's Day is celebrated for a special person of the family - father. All the sun and daughter are express love feeling with their dad and make a day extremely special. If you want to celebrate this Father Day with your father, then you need to some Beautiful Fathers Day Images, Fathers day Wallpapers, and Fathers Day GIF. Happy Fathers Day Here we collect best Fathers Day Quotes Images for you. Father's Day is celebrated in all over the world on the different days. Great post. I like this website so much it's really awesome. I have also gone through your other posts too and they are also very much appreciate able and I'm just waiting for your next update to come as I like all your posts. I hope everyone will be like this post. Well I have also made an article hope you go through it. I hope you and your valuable readers will be like my collection.Because New Year 2018 is knocking in our door. People also try to searching Happy New Year 2018 Status and wish New Year using Happy New Year 2018 Wishes. People also like Like Happy New Year 2018 Images. Thanks again. In this website is so nice It give more information and useful post. Informative post. Thanks for share. What a great article!. I am bookmarking it to read it over again after work. It seems like a very interesting topic to write about. Your posts is really helpful for me. Very helpful post for everybody.